This amazing show features Mentalism, the supreme magic of the mind. Zurbano uses intense audience-participation with feats that impresses even the most analytical minds. Watch as any audience member calls out playing cards and they instantly appear in her hands. See her read the minds of several volunteers, without their permission! She demonstrates mass-mindreading and uses the danger of knives to prove her powers of clairvoyance. This is an intimate show—you will get to know the rest of the audience quite well before the night is over. Joined by a special guest! Whether on the guitar or the piano, Abby’s true-to-life lyrics leave nothing hidden from her audience. Each show, she brings her smart and soulful sounds to the stage with her unique style with songs about time, money, freedom, love and consumerism. Limited seating, please reserve your seats in advance. Table service for food and cocktails is available. Maritess Zurbano is a master magician, mentalist, and hypnotist. She began as a Las Vegas magician, performing at every major casino on the Strip for private and corporate events. She worked at the Dunes Hotel as a blackjack dealer. Her magic life includes a brief stint as a professional baccarat player, ownership of a fortune-telling business in Nevada, work as a master phone psychic, and headlining in her own illusion show in Japan. She is most proud of competing against 150 magicians from around the world at the Fédération Internationale des Sociétés Magiques 2000 in Lisbon, which is colloquially referred to as “the Olympics of magic”. Currently, she performs her show at casinos, corporations, colleges, and at private events around the world. 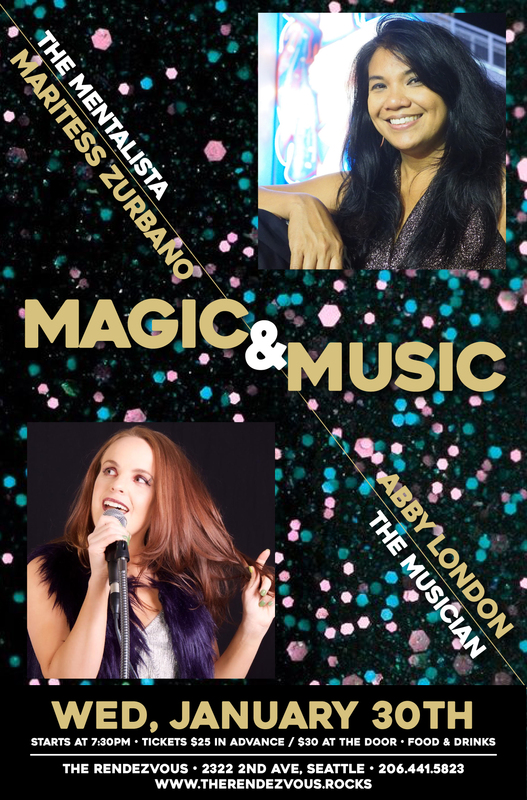 Her mind-blowing and and hilarious shows deliver a dynamic combination of expertise, professionalism, and honor to take audiences on a magical adventure with the mind. Zurbano keeps the laughs rolling and the content clean. During her shows you will feel the amazing power of your own mind. She is regularly profiled in the media and asked for her opinion on magic and the occult. Her 2013 guest editorial for the Seattle Times focused on the dearth of women in magic. Media including Lifetime Television and The BBC News consistently seek her commentary.